This is part of the 12.7 acres at issue in the zoning appeal north of Pleasant View Way in North Albany. If you thought that a North Albany rezoning request would fade away in the face of strong neighborhood opposition, forget it. At least it hasn’t yet. 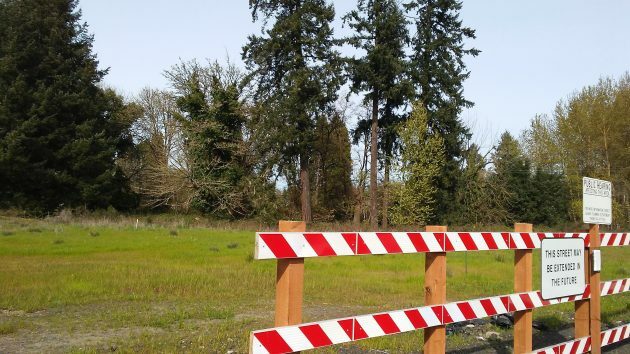 On May 24 the city council continued a public hearing on the request by Portland developer Jim Winkler to rezone 12.7 acres off the north end of Pleasant View Way and west of the North Point subdivision. He is seeking the rezoning from apartments to mixed use in order gain more flexibility in how to develop a cluster of apartment houses and related services. The property could hold about 300 units. Neighbors have expressed their opposition in letters to the planning department as well as statements to the council and, before then, to the planning commission. About the only support for the request came from Samaritan Health Services, which has medical offices nearby. The planning commission held a public hearing and then turned down the request, and Winkler took his case to the council. He then asked for the continuance to allow him to make a presentation to the council showing what kind of development he had in mind. The presentation apparently had fallen victim to a computer problem in Portland. This week I learned from David Martineau, lead current planner in the Albany Community Development Department, that Winkler intends to press on with his appeal, and the public hearing before the council will resume on Aug. 9. Because the date had not been set at the time of the last hearing, the city will have to send notices of the date to everyone who submitted testimony, either in writing or in person. I have found more opposition to hundreds of new residents and commercial business coming to the field opposite my home. From: The doe who peeped through my window the other night. And from: The feral mother cat and two kittens living in the field. A smaller apartment complex might fit in (my attempt to put a sort-of positive spin on our ordeal). It seems obvious; there is no overwhelming empathy for the soon-to-be mired down amongst the Great Rental Society clan. In the real world, massive apartment complexes, gargantuan shopping venues and Strip Malls crammed with stores selling stuff no one needs pop-up regularly, creating noise pollution, vehicular insanity and more than a small degree of irritation. The North Albany Compound has been breeched. May whatever Gods those fine folk believe in have mercy ontheir souls. I watched the hearing on Albany Council on TV……though not resident on that side of town….seemed to me that not enough detailed info presented by developer on exact types of businesses except those allowed…..if it was my neighborhood…for sure I would need to know a LOT more details. The impact of vehicular travel is a HUGE DEAL for all community of Albany…..hard to travel over the bridges now at peak times….cannot imagine working commuters squeezing in more Vehicles! Maybe we will need a ferry crossing over Willamette! Glad to see Council taking more time to investigate….big deal for all of us coming or going to/from North Albany!